When it comes to voter rights, Oregon’s reputation is second to none: We’ve led the way by passing vote by mail, online voter registration, and pre-registration for sixteen year-olds. But now, Secretary of State Dennis Richardson has introduced a rule that would roll back common-sense voter protections and make it easier for anti-immigrant and anti-choice groups to qualify their harmful ballot measures. Richardson is proposing drastic changes to the democratic initiative process: Most notably, he wants to allow petitioners to circulate petitions without a ballot title or the text of the proposal. That would make it almost impossible for voters to know what they’re signing — and make it easier for petitions circulators to mislead (or outright lie to) potential signers. Richardson is making these changes because he knows when voters know what they’re signing, they don’t support rollbacks to immigrant protections, choice, and workers’ rights. Instead of giving voters the power to make good decisions, Richardson is letting signature gatherers collect new signatures in secret. The media is reporting that extremists are already taking advantage of this rule to peddle their bigotry. This rule change would take us back to the Bill Sizemore era of fraud and lies in our initiative process. It’s not too late to stop this attack: Richardson’s office is currently accepting public comment on the rule change. 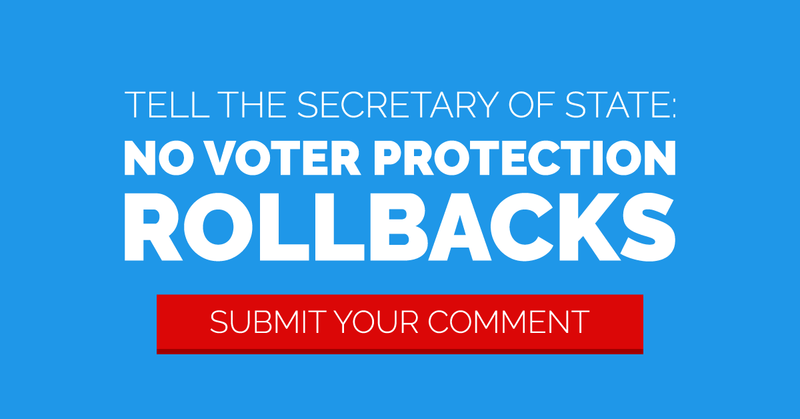 We need to show him that Oregonians won’t accept voter protection rollbacks. Submit your comment below to fight back!